The title of this article is quite ambitious. To cover all of that, it would be a 50,000 word book. 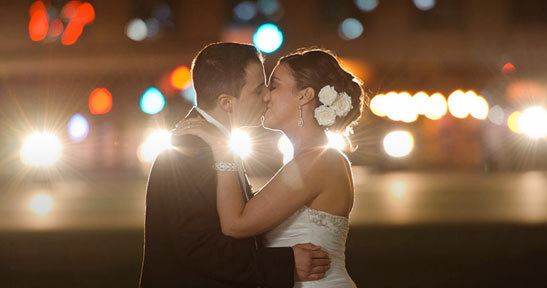 But in editing this wedding at the moment, I noticed this photograph, and I love the look of it. So in the context of that one single image, let’s look how it all came together. While the photograph itself isn’t complicated, a lot of quick decisions went into making this image work … and easy to edit. A number of things had to be considered, but instead of being overwhelmed by juggling all the decisions and thought-processes simultaneously, there’s a way to break it all down to simple elements which will help the photo session come together naturally. This was shot around 2pm on a sunny summer’s day. It’s hot and the hard sun isn’t flattering. 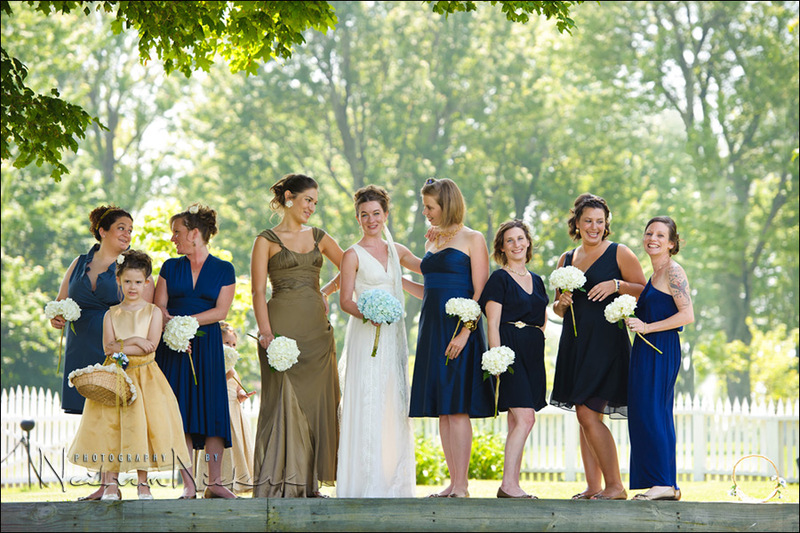 Therefore my first thought in working with the bridal party here is to have even light on them – preferably open shade. 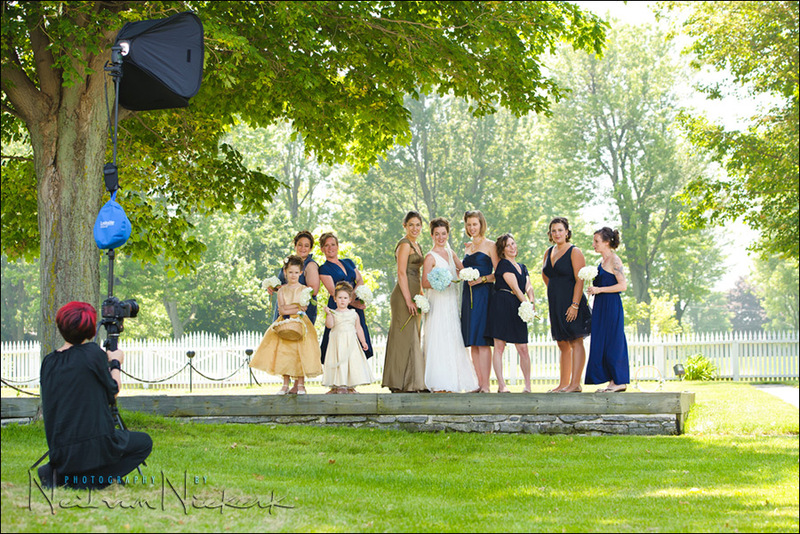 I also know that I want to photograph the bridal party at several spots around the grounds of a historic building. This way I can get variety … but I also limit my choices to areas that make it easier for me to shoot and edit the images. 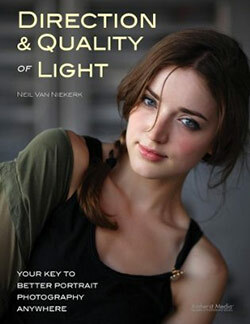 This, for me, usually implies clean open lighting. I found this shady spot under the tree here, with a neutral background. A good background is one that is neutral or complementary. Not too busy and distracting. If I hadn’t been able to find a shady spot then I would’ve found some place where I still have a good background, and had my subjects turn their back to the sun. I want everyone’s face to be evenly lit, without harsh cross-shadows from the sunlight. So now we have shade. Great. The side benefit here is that it keeps everyone cool. It is okay for me to work in the hot sun, but my client or subjects should look cool and relaxed and happy. The open shade here works like a charm, giving me great light. I can let the background blow out to an extent. I don’t care much for specific “correct” exposure for the background. It’s just context. And if the background is somewhat over-exposed, it helps convey a bright, hot summery day. The brighter background also helps isolate my subjects by creating separation from the background. It is an extremely useful thing to constantly learn what the usual camera settings are for bright sunlight, as well as for shaded areas. When you work and play with your camera, take meter readings or test exposures. This way, when you’re actually doing a shoot, you have a good idea of the range of settings which would make sense. So from experience, I knew that open shade like this under a tree, would be in the order of 1/250 @ f4 @ 200 ISO … and I was right. The choice of camera settings isn’t a lucky guess, but comes with years of experience and playing with a camera, and remembering the usual settings that would come up for specific types of light. This helps me get there faster when working under pressure. And there’s less pushing of buttons and turning of dials in front of your client. You can just concentrate on the other aspects of the shoot, such as directing or talking to them. You have to become very familiar with your equipment. Play a lot! So for the rest of the images, I dialed to f4.5 as my working aperture. This aperture gives enough “bite” to the lens’ sharpness, and there is enough depth-of-field (DoF) for a group posed like this in a single line. The image at the top was zoomed to 140mm, and the second image of the group was shot with the lens set to 90mm. So at these medium telephoto focal lengths, the f4.5 aperture gives a fairly shallow depth-of-field, without being f1.8 kinda crazy for this group. The aperture choice makes sense. For my shutter speed – since I knew I would add fill-flash – was immediately set to maximum flash sync speed. It just made sense. And there was no need to go into high-speed flash sync territory to chase a shallow depth of field. I already had the DoF that I wanted. And there we have our settings, with off-camera TTL fill-flash (via a softbox) picking up the exposure a bit on them, enhancing the light. The softbox was my usual Lastolite EZYBOX 24×24 softbox (B&H), with an Nikon SB-900 (B&H); Nikon SD-9 battery pack (B&H) … and with the flash fired with a PocketWizard FlexTT5 transceiver (B&H), controlled with another FlexTT5 on my camera. Dead simple. The style that I prefer for wedding portraits and group photos, is less formal than would be expected from a wedding photographer working in a traditional style. Therefore, when photographing someone, whether individually, or as a group, my approach is more to guide their natural pose. Rather this than formally positioning someone according to classic rules of posing. It is easier to guide someone’s natural stance of posture, than force a more specific pose. Besides, the couple on this day was far from formal. 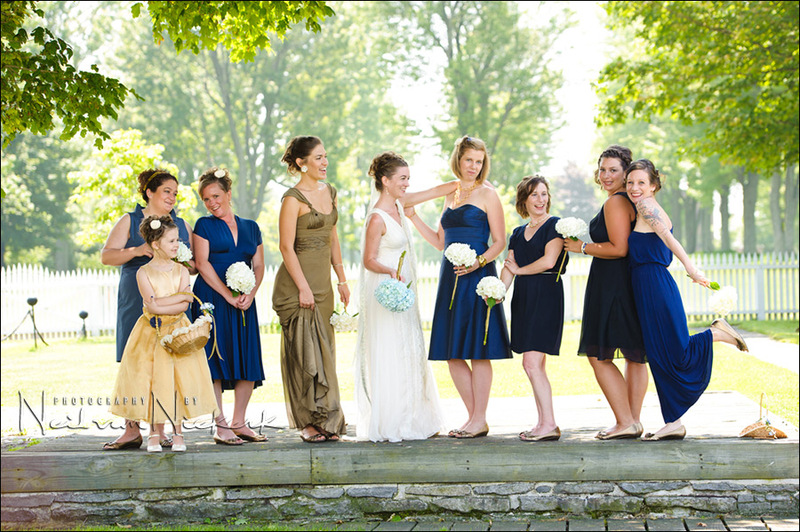 As you can see, the bridesmaids wore shades of blue, with different styles and cut for their dresses. So an overly posed look wouldn’t really be necessary here. So I am more attuned to how they might turn their body, or hold their head or hands. A simple instruction to someone to lean … or jokingly telling them to flounce or drape themselves over something (or someone), always helps in getting reaction and a smile. You will notice that my viewpoint in the image right at the top is lower than the 2nd image of the group. I noticed that there was too much of an overly bright area behind their legs … so I dropped down in my position to eliminate most of that as a possible distraction for the rest of the sequence. Oh, and in the pull-back shot, you can see Jessica, busy shooting HD video on the Canon 5D mk2 … a fusion clip is in the works. There we finally have it, in a much shorter time than it took to describe this. Fast to set up, fast to shoot … and an easy edit because of the clean open light. A bunch of decisions easily made to get fun, energetic photos of this group. congratulations again for your work. 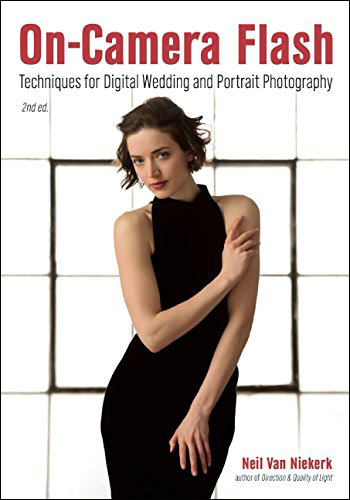 One question: In this photograph your experience as a professional photographer tells you that 1 / 250 f4 aperture settings are correct for subjects in shade. In another context, it is good to expose correctly for my background and then let my TTL flash take care of my subject? If my background is very bright and I can always apply this technique should find another background? If I had used that power with manual flash Flash (1 / 2 or 1 / 4) would have snapped this wonderful picture? You’re the best … thank you for everything. 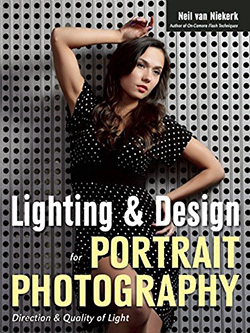 Edy, that thought-process is neatly explained in this article – Flash Photography tutorial. The idea is that you can expose for the ambient light (on your subject) any way you want, and then have the flash pick up the slack, and give you correct exposure overall. So the choice is quite wide as to how over-exposed / well-exposed you want the background in this instance. Why is there a Lastolite (blue bag) suspended on your light stand ? What purpose does it have ? It holds the plutonium-powered nuclear reactor which in turn fuels the 1.21 gigawatts flux capacitor inside the softbox. So now I’m not reliant on waiting for a lighting bolt to strike. Great post Neil. Often times I have to fight the instinct to ALWAYS expose properly for the bg and then balance the fg with flash. Sometimes it looks great but in situations like these it doesn’t look natural. The washed out bg looks even better with the shaded leaves providing context. Just curious why you use a softbox instead of a shoot through umbrella. Better in the wind? I had a softbox with me, and not a shoot-through umbrella. Sometimes that’s how the choices are made for you. You recently remarked on the forum that the PocketWizards do not transmit the FEC settings back to the camera (because I couldn’t see the FEC data in my images using the units). How are you able to remember your FEC settings for the photos throughout your wedding assignment, since you probably have to change the settings several times? The AC3 doesn’t show the FEC in the EXIF data. However, I wasn’t using the AC3 here. I was using the Nikon D3 overall exposure compensation, which shows in the EXIF data. Like others I’m curious… when you knew you were going to use the soft box to add fill light (and went with your max sync speed for shutter speed) did you also know you were going to fire the strobe at -1.7EV or did you have to experiment with that a bit first? To find the right amount for your desire. And while not a wedding photographer I truly appreciate your conveying the thought process here, especially when noticing those tiny details like the overly bright area behind their legs when you stood higher for the shot. 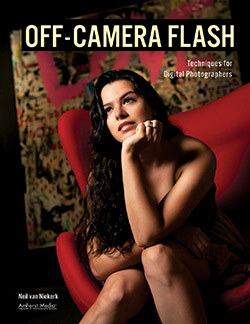 This linked article discusses on-camera TTL fill-flash, but the idea remains the same. With fill-flash, you have a much wider range in settings with which the image will still look good, and not be over-exposed. So, from experience, I know that around -1.7EV is good. Not so gentle that it will be imperceptible, but not so strong to appear noticeable. Just enough to make a slight difference. But it could’ve been FEC anywhere around there. There’s no one specific correct setting. Great work as usual Neil. What would your camera settings have been if you wanted your background more in focus or less blown out? I noticed how warm the flight from the softbox is, did you use CTS/CTO gel for this? I didn’t see this mentioned. A subtle ‘warming gel’ is always nice with flash for outdoor use. Nope, no gel. Just a change in the WB in editing the RAW file. Where do you buy your plutonium-powered nuclear reactors? 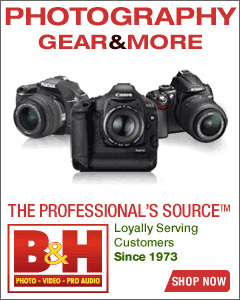 Normally you have a B&H link to products you mention. I’m having trouble locating them. Thanks. Thanks for clarifying about the AC3 unit. I went back into my archives and looked at photos I took without the AC3 unit. I was using a SB-900 as the commander mounted on a PocketWizard, and in that case, the FEC information was transmitted into the EXIF. Neil, at that distance, do you find that a softbox has and advantage over a bare flash? Yes, it’s a larger light source that gives less specular light. Moving the softbox back a few feet back doesn’t make it a small light source. I noticed that your lightstand can go up to 12′. I’ve never tried group lighting like this and want to try it. About how high would you guess that it is for this group, and about how far from the group? That’d be helpful to me. Thanks alot. The softbox was about 8′ or 9′ up so that I could still get that 30 degree elevation of the softbox above their eyes. And the light-stand’s distance … I don’t recall. I pulled it back far enough so I could get a clean shot at a medium telephoto focal length. Neil, very nice photo indeed. I have a question about your ISO setting. Why do you choose to use 200 instead of 100. Is it because you specifically wanted the DOF of 4.5 at the maximum flash sync speed of 1/250? Why wouldn’t you use ISO 100 which means you would have more room to play with the aperture before you exceeded the max sync speed. You might not always want to, but if you used ISO 100, this would give you the option of going one stop wider with the aperture if you so desired. One reason I can think of is that you like to stay as close to the max sync as possible, which would make sense. Is this why? The base ISO of the Nikon D3 is 200 ISO. Also, in using 200 ISO (which I most likely would’ve selected if I had use a Canon camera), gives me an aperture there of around f4 … which is juuuust right. Looks great Neil! I’ll have you know that I”m a fanatic for the CTO gels. Did you gel the flash for this photo? Nope, no gel. Just how I edited the WB of the RAW file. I’m just bewildered at pocket wizard for placing the screwmount off centre from the flash head (TT5).. I don’t think it is as problematic using the Lastolite EZYBOX, but i can’t buy those boxes here in Asia. The off-center screw-mount of the TT5 hasn’t bothered me, and I have barely noticed it like that. When I mount the speedlight on top of the TT5 on the bracket of the Lastolite, I turn the flash sideways anyway, so that the speedlight’s face is inside the softbox. Thanks for the response to my question. It’s very helpful… as is your daily feeding for folks like me. 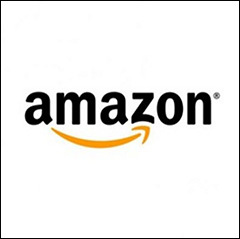 I was wondering how long it would take for someone to ask where you buy the “plutonium-powered nuclear reactors”!!! My smile for the day! Read your blog on this shoot Neil. Your advice of “Play a lot” was right one the money. They may get good exposure, but oft at the cost of creativity. On the other photos for this wedding, can you tell me a few things. 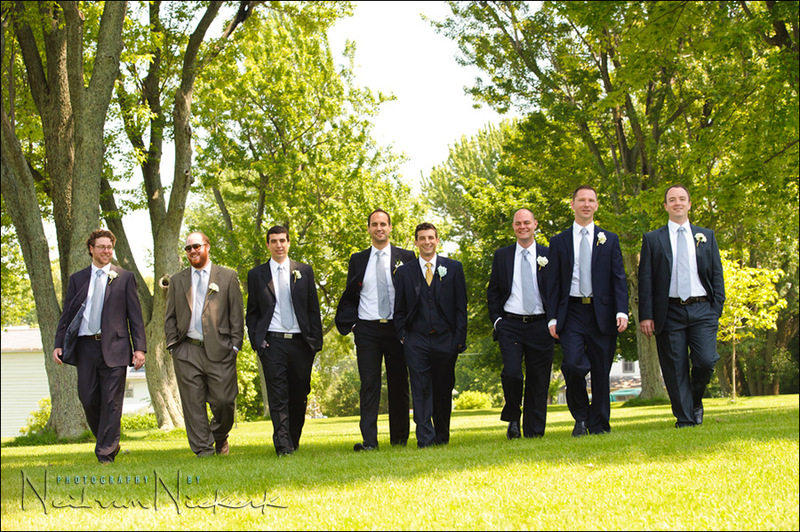 The one of the grooms men all walking towards you. Did you use the soft box or fill flash as I see absolutely no dapple and I struggle with that a lot this summer. The night photos of the paper lantern release can you explain a little how you did that. I thought low shutter speed but seems you stopped some action as well. Love your stuff and hope to meet one day. Joe, with this I really try to have as even light on them as possible, having them with their backs to the sun. 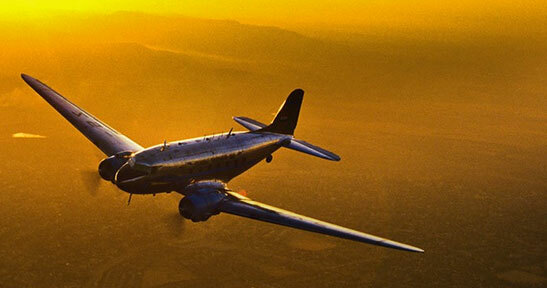 It’s about the best you can do with the sun overhead. I did use the shade of the trees there, but there are patches of sun coming through. So it has to do with how I position myself in relation to them and the sun. And then I add a touch of on-camera fill-flash if I feel it is necessary. Regarding the paper lanterns, as explained in the follow-up post – there wasn’t much more to it than going as high as I could on the ISO (3200), and a wide aperture (f2.8) on my lens that I had on my camera .. and then I’d have the highest possible shutter speed while getting correct exposure. Correct exposure via a few test shots. Exposure errors taken care of via editing the RAW file. Just curious, were you spot metering the bride? You mentioned fill flash and ttl not ttl/bl. Congratulations on such a tremendous job teaching and sharing your knowledge. I have learned a lot from you regarding speedlights and controlling light. I also own all your books. Thank you!